The battle of Chickamauga is remembered as the only victory for the ill-starred Confederate Army of Tennessee. At stake: control of Cattanooga, “the Gateway City” to the Deep South. The battle left a legacy of dashed hopes for both Confederate commander Braxton Bragg, who won the costly victory but lost the city he fought the battle for, and Union commander William Starke Rosecrans, who, though defeated, held the city that President Lincoln considered just as important as the Confederate capitol of Richmond. Despite its importance, however, the battle has been largely overlooked and is rife with myths and misunderstandings. Author William Lee White has spent most of his life on the Chickamauga battlefield, taking thousands of visitors through the wooded landscape and telling the story of this bloodiest engagement in the Western Theater. 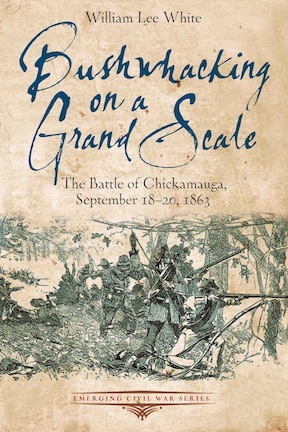 Bushwhacking on a Grand Scale describes the tragic events of Chickamauga but also includes many insights about often-neglected aspects of the battle that White has gained from his many years studying the battle and exploring its landscape. Bushwhacking on a Grand Scale can be enjoyed in the comfort of one’s favorite armchair or as a battlefield guide. It is part of the new Emerging Civil War Series, which offers compelling, easy-to-read overviews of some of the Civil War’s most important stories. The masterful storytelling is richly enhanced with hundreds of photos, illustrations, and maps.